The Govt. 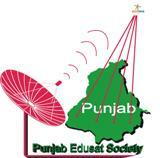 of Punjab has set up Punjab Edusat Society for providing quality education to the Govt. educational institutions of Deptt of School Education, Higher Education, Technical Education and Medical Education. The Edusat network was dedicated to the State on 02.01.2008 by the Hon'ble Chief Minister Punjab. Punjab Edusat Society has set up one Hub and three studios in the premises of Punjab School Education Board from where independent programmes of Higher Education as well as Technical Education are being broadcast. All the three studios have been equipped with the State of the Art equipment and peripherals. 3823 educational institutions are being covered under Edusat network. The institutions with Satellite Interactive Terminals (SITs) (516) cover Medical & Dental Colleges (5), Higher Education (47), Technical Education (29) and Department of School Education (436). 500 Receive Only Terminals (ROTs) were provided in the Govt. Sr. Sec. Schools of State having Humanities Group in the year 2009 and was approved in the 2nd meeting of Executive committee held under the chairmanship of Hon'b'le Chief Secretary to Govt. of Punjab on 19th June 2008. In expansion phase, 2807 more Govt. Sr. Sec. Schools (Humanities Group) and Govt. High Schools are being covered with ROT facility as per decision taken in 8th meeting of Executive Committee of Punjab Edusat Society held on 15th Dec 2011. 3150 Edusat Computer Libraries (E-Libs) are being established in Govt. Sr. Sec. and High Schools to help the students and subject teachers to view the Edusat and CAL multimedia content as per decision taken in 7th meeting of Executive Committee of PES held under the Chairmanship of Hon'ble Chief Secretary to Govt. of Punjab on 15-09-2011. Out of total 3150 E-Libs, 2077 E-Libraries have been fully established in the financial year 2012-13 and 1073 more E-Libs are being established in remaining Govt. Sr. Sec. and Govt. High schools. These libraries are also being shared by ICT project for providing computer education in place of 1st Phase of computer labs. 1003 portable Gensets have been provided to the govt. institutions to meet the power failures. POL cost was also provided for their running. The special programmes for Science students for preparation of competitive Exams, Soft Skills Development Programme, Career Counseling and training programmes for teachers are telecast along with regular courses for 8th to 12th class students throughout the State for the Department of School Education. Daily 7-8 lectures on all working days are delivered by Deptt. of School Education, 5 lectures by Deptt. of Technical Education, 2 lectures by Deptt. of Higher Education and 1 lecture by Deptt. Of Medical Education. This year also the Programme on preparation for Competitive exams for Medical and Non-Medical students was also imparted as a Crash Course by hiring the faculty of M/s Gyan Sewa Trust. 13000 students were enrolled for this programme. The training to English lecturers was imparted through Edusat Network under Soft Skill Development Programme which was highly appreciated by the teachers. The soft skill programme for the students of 11th class has been started in this academic year i.e 2013-14.